Bank of America, which operates the largest network of bank-owned ATMs in the U.S., has finished equipping all of its more than 18,000 ATMs in the U.S. with text-to-speech for its customers with visual impairments. These talking ATMs provide audible instructions in English or Spanish to persons who cannot view information on an ATM screen, aided by the use of audio jacks that work with standard headsets to protect customers’ privacy and security. The 1990 Americans with Disabilities Act requires that banks eventually make their ATMs audio-enabled. Bank of America was one of the first U.S. banks to begin installing talking ATMs across the country, but in recent years has been under fire for not finishing the job fast enough. One disability organization, the California Council of the Blind, has been working with the bank for several years on issues of banking accessibility. Such cooperation has helped the bank avoid expensive ADA-discrimination lawsuits. In addition to talking ATMs, Bank of America is also the first major bank to equip all of its 13,000-plus deposit-accepting ATMs with deposit imaging technology. Deposit Image ATMs lets customers feed checks and cash directly into the ATM slot without envelopes and deposit slips. For people with visual impairments, the information will display via audio for verification. Bank of America isn’t the only bank to offer voice-enabled technology on its ATMs. 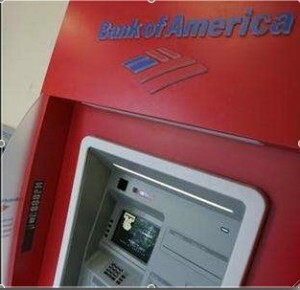 Wells Fargo and Chase also provide talking ATMs, but not as many as Bank of America.